Orson Ossman, a Whidbey native, returns home this week for the 10th year reunion of his 2006 South Whidbey High School graduating class. With him, he brings evidence of his work in the world—writing, producing, directing and occasionally starring in independent films that tend towards the genres he grew up watching on blurry VCR’s on his parents old TV or in Mr. Durbin’s “Film as Lit” class, a storied favorite among several generations of SWHS students. From Erroll Flynn’s “Robinhood” to Gary Cooper’s “High Noon,” Ossman took inspiration from them all. 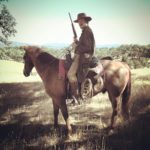 Ossman’s newest film, “Five Grand” was shot on location in northern California last summer and the production is currently in negotiation with a global distribution company. It will have a one-time, pre-release screening locally at 1 p.m. on Monday, August 22 at The Clyde Theatre. There is a suggested donation of $5 at the door. A “Q&A” will be held with Orson afterwards. “Five Grand” has won several awards, including a Gold Remi for Best Western at Worldfest Houston (the Houston International Film Festival), top honors as Best Western at The Trail Dance Film Festival in Oklahoma and Best Western at Cinema-on-the-Bayou in Lafayette, Louisiana, among other honors. Ossman’s first independent, full-length film was “The Phoenix Project,” which was co-written and co-produced with his partner Tyler Pavey. Funded by a successful Kickstarter campaign, it was a nod to speculative sci-fi classics, such as the original Twilight Zone series, which made much out of the creative use of minimalist surroundings and edgy writing. Following national distribution, “The Phoenix Project” film can be seen on Netflix and Hulu. Following his graduation from SWHS in 2006, Ossman went to the London Film Academy for a year, receiving a certificate in film production and then went on to Chapman University’s Dodge School of Film and Television, where he received his B.F.A. in film production with an emphasis on directing in 2012. Upon graduation, he and his Chapman co-hort formed the Ironwood Gang as an independent film production company. They have been working to create new works in the film medium ever since.